Danica Patrick (left) and Ricky Stenhouse Jr. (right) battled for top rookie honors in 2013. Although NASCAR does not keep official statistics on such matters, it’s a pretty safe bet that 2013 was the only season in the sanctioning body’s history when the two top contenders for NASCARâs Sprint Cup Rookie of the Year honors were romantically linked. But that was the case this past season as Ricky Stenhouse Jr. and Danica Patrick both competed to be the sport’s top rookie while managing to keep their off-track relationship flourishing. Patrick grabbed the lion’s share of the headlines in 2013, as expected, starting with her historic capturing of the pole for the Daytona 500. But in the end, it was Stenhouse who walked away with the rookie honors — and by a fairly wide margin. In truth, neither driver had a stellar season, if you go just by the numbers. In 36 starts, Stenhouse posted one top-five and three top-10 finishes, ending the season 19th in points, with winnings of $5,420,869. Patrick had just one top-10 — an eighth-place finish in the Daytona 500 — and finished 27th in points with earnings of $3,529,700. Of the drivers who started all 36 Cup races, only David Ragan, David Reutimann and Travis Kvapil finished behind Patrick in points. Stenhouse said his rookie campaign had its highs and lows. "It definitely wasn’t the season that we wanted, but we slowly but surely got a little bit better throughout the season," he said. "I was proud of what we did throughout the season, of getting better, qualifying better, having runs up front, leading laps throughout this year. Thought we had a chance at winning some races there, at least being in contention. I was proud of those moments." But there were more challenges than moments of triumph. What is tough about the Cup (level) is that you can’t be a little off. The difference between a good and a bad weekend is so much bigger than in the Nationwide Series or anywhere else. "We had a lot of bad moments we want to forget," he said. "All in all, it was definitely a huge learning experience. It was about all I thought it was. Coming in, I didn’t expect to run top 10 every week. We wanted to definitely have more. … Thankful we made it through; it’s behind us now. We can move on to next year, look on improving every spot at every track that we can in the final points standings." To that end, Stenhouse will have a new crew chief in 2014 as Mike Kelley, his former NASCAR Nationwide Series crew chief, will replace Scott Graves. As for Patrick, she and crew chief Tony Gibson will remain together next year. The 2013 campaign was a frustrating one for the former IndyCar driver, who was consistently in the public eye in a way that her male counterparts weren’t. Sometimes that was good; other times not so much. "The biggest learning curve is usually the first year, so the most has been learned this year, and I just look forward to the results improving," said Patrick. "I look forward to better weekends and that with hard work will happen in return." One of the most eye-opening experiences for Patrick was just how close the competition is in the Cup series. "What is tough about the Cup (level) is that you can’t be a little off," she said. "The difference between a good and a bad weekend is so much bigger than in the Nationwide Series or anywhere else. The competition, the level of effort is so high. You have to always be on your game." As for the battle to win the rookie title, the two never let it come between them off the track. 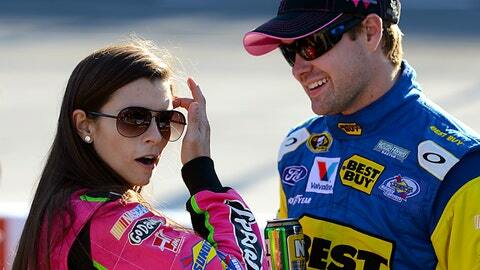 "We joked a little bit about it, but we didn’t really focus too much on it," said Stenhouse. "We definitely wanted to focus all our efforts on the racetrack, just try to get the best finish we could every week." "We didn’t really have too much banter about it, I don’t think," added Patrick. "I think that it was just something that we didn’t really talk about. We talked a lot more about the cars. We talked a lot more about the team. We talked a lot more about purely what happened that day. He spent a lot of time trying to cheer me up after I was so disappointed after qualifying or after a race sometimes."